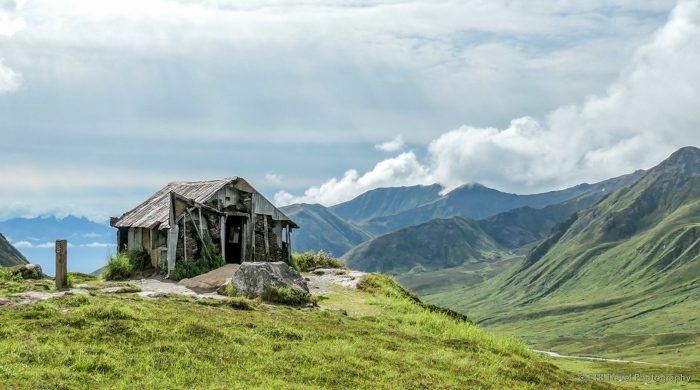 For another day trip from Anchorage, we visited Independence Mine State Historical Park located just over an hour’s drive northeast of Anchorage. The mine opened in the early 1900’s after Robert Lee Hatcher discovered and staked the first gold lode claim nearby. The Independence Mine was once two mines. The Alaska Free Gold Mine and Independence Mine merged in 1938 and were named Alaska-Pacific Consolidated Mining Company (APC). APC became the largest gold producer in the Willow Creek Mining District with claims that covered over 1,350 acres. In its peak year, 1941, the mine employed 204 employees and produced $1.2M of gold which in today’s dollars is $17.2M. Gold mining was halted in 1942 during World War II, but Independence Mine received an exemption due to the presence of scheelite which is used in tungsten, a strategic metal. The mine’s low production of scheelite, however, led to its closure the following year. After the war, gold mining continued, but it was short-lived and the mining finally closed in 1951. The mine consists of 27 structures, many of which have been refurbished. We spent about an hour exploring the small, ghost town and mining structures before we set out hiking. Ross and I chose the Gold Cord Lake Trail. It turned out to be much easier and shorter than we expected. We took a leisurely stroll up the path to an old cabin before we continued to the beautiful lake tucked beneath the peaks. We sat on the shore and watched the reflections of the moving clouds on the placid surface. We bored quickly, however, as we reached the lake in thirty minutes or so and had a few hours to kill while our friends hiked the peak. As such, we decided to climb up to the waterfall that was feeding the lake. This bushwhacking along the mountainside proved a little more challenging. The terrain was somewhat steeper than and the waterfall was a bit farther away than they appeared from below! We scrambled across the moss and rock and stopped every so often to take in the view of the lake and the ghost town in the lower valley. Next Post Fishing in Alaska…NOT!